A handmade pair of English shoes is more like a bespoke car, or an artwork, rather than a simple item of clothing. We want you to know how best to look after and cherish your shoes, so that they can serve you well for years to come. Try to wear your shoes in dry conditions for the first few occasions. Avoid getting your shoes extremely wet, should this occur allow your shoes to dry naturally on shoe trees and lay the shoes on their sides rather than on their soles. Never use direct heat. Do not wear the same shoes on two successive days. The leather needs time to dry and recover after each wearing. Shoe trees should be used after each wearing to maintain the shape of the shoe and help them dry out. You can wipe the shoes down and apply a quality cream or wax polish after every wearing to feed the leather and prevent cracking, even if the shoes do not appear to have lost any of their original shine. Avoid unsuitable additions to either sole or heel, such as stick-on soles, as these can affect the balance, comfort and life of your shoes. Repair your shoes in good time by using a reputable repairer. The majority of our shoes can be returned to the manufacturer for a full rebuild on the original last. You can take a look at our shoe polishing video below for more advice or call us if you have any questions, we are always happy to help. 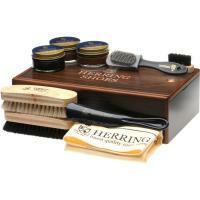 Keeping your shoes clean will prolong their life and improve their appearance so here is our polishing guide. The polish and creams that you use to keep them looking great also protect the leather from water damage and nurture the leather, keeping it supple. 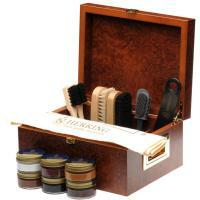 Firstly you should remove any dirt and dust by brushing the leather with a horsehair brush. This prevents particles of dirt being rubbed agains the delicate leather of the shoe during polishing and causing damage to the shoe. 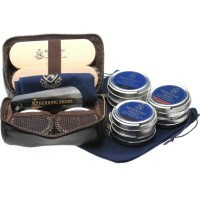 Next we recommend you apply a simple shoe cream that will nourish the leather and keep it supple. Apply a thin coating all around the shoe with a cloth and rub it in well. Usually we would use a neutral cream so that you do not alter the colour of the shoe, however, if you want o darken the colour, you could use a slightly darker cream. It can be very unpredictable what colour the shoe will be and although you can darken a shoe it is very difficult to lighten it if you make a mistake so please be very cautious. An added factor to remember is that leather is very absorbent so it will look darker when you apply cream due to the cream being absorbed into the shoe. Always allow the shoe 20 minutes or so after applying cream to see what change of colour there may be. Apply a wax polish, the best contains beeswax, with a cloth and allow to dry for 5 minutes or so. The shoe will probably look fairly dull at this stage so now you can use a fine horsehair brush to polish the shoe by rubbing backwards and forwards. This action causes friction between the brush and the polish making it melt - this is what makes it seem to shine. You can apply a second coat of wax for a deeper shine and polish as before. As a final touch you can either use a soft cloth and rub the shoes down to get rid of any small bits of wax that are left or, even better, use a nylon rag such as an old pair of tights as they will bring the shine out even more. The most important way to maintain your suede shoes is to use a suede protector spray to help the leather repel dirt and water. Ideally you should do this before the first wearing as you never know when someone may spill a drink over your shoes! For regular maintenance, use a suede brush to remove any dirt and buff using the back (rubber) side of the brush if you have a stubborn mark.